Vermont is a state of the northeast United States bordering on Canada. There are many famous Native American tribes who played a part in the history of the state and whose tribal territories and homelands are located in the present day state of Vermont. The names of the Vermont tribes included the Abenaki, Mohican, Pennacook and the Pocomtuc tribes. The climate, land, history, environment and natural resources that were available to the indigenous Indian tribes in Vermont resulted in the adoption of the Northeast Woodlands culture. Meaning of State name: Named after "Verd Mont" in 1647 by the French explorer Samuel de Champlain meaning green mountain. 10,000 B.C. : Paleo-Indian Era (Stone Age culture) the earliest human inhabitants of America who lived in caves and were Nomadic hunters of large game including the Great Mammoth and giant bison. 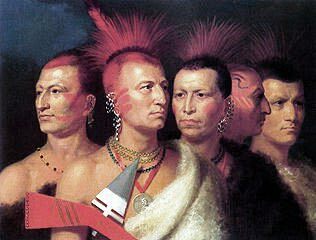 1702: (1702-1713) Queen Anne's War (part of the French and Indian Wars) between the French and Spanish colonies allied with the Wabanaki Confederacy, Mohawk, Choctaw, Timucua, Apalachee and Natchez tribes against the British colonies allied with the Muscogee (Creek), Chickasaw and Yamasee tribes. The history of the European invasion brought epidemic diseases such as tuberculosis, cholera, influenza, measles and smallpox. The Native Indians of Vermont had not developed immunities against these diseases resulting in huge losses in population. Exploitation including the leverage of taxes, enforced labor and enslavement were part of their history, taking their toll on the Vermont Indians.